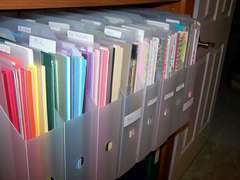 Most scrapbook stores will store their paper horizontally because they have the room for rows and rows of shelves and racks. Now, most of us don't have room for all those shelves, but horizontal storage is still a possibility with 12" x 12" plastic snap top cases. You can buy them individually or as part of a three-drawer or six-drawer cart, so you can make the most use out of your vertical space. " 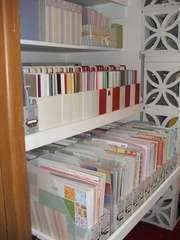 Cardstock - seem simple enough, by color right or brand? But what about those patterned papers? 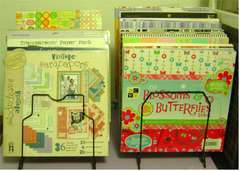 Do you Separate your cardstock from your patterned paper? Or would it work better for you if you had all the pink patterned paper then pink cardstock together? 2) By Brand & MFG - do you have a great memory for brands. Do you think to your self when you are scrapping..."that rust and white flourish paper from the Everafter line that Cosmo Cricket put out would be perfect!" 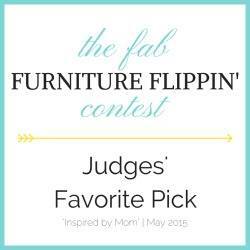 If so they by Brand and collection would be the way for you to organize. I chose to sort by color. Each color has it's own vertical cropper hopper. The Patterned Paper is first then the Cardstock with a cropper hopper divider in-between. I am loving this system... if I am creating a blue page I can snag my Patterned paper and Cardstock all at one time. Streamlining the way my brain thinks and coordinating it with the organizational choices in my room. Perfect! I have been getting a lot of questions about my spilled paint pen holder. It takes several days so you will need to be patient but the end result is so cool I am very happy with the project. The thing I love most (besides the kick I get out of people thinking I really spilled paint on my desk) is how it is totally movable and I can put it anywhere! 8) A circle punch (I needed a 1/2") to cut the paper label to fit around the base of the handle where it connects to the can. 1) Chose a flat clean surface (I used our spare bathroom counter top). 2) Line the counter top with press'n seal or cling wrap (I used press'n seal because it stays in one place by itself, if you use cling wrap you might want to tape the edges to the counter to keep it smooth and flat) make sure it is flat with no bubbles or creases. 3) Glue the two bottom can's together in the front and the back,(if you are going to stack them. I used hot glue. 4) Place them in the center back of the covered counter top. 6) Dribble and pour a little of the paint colors at a time. Make sure you do them all at this point so they can touch... mix and dry together. Also make sure it is thick. This takes days to dry so make sure it is not disturbed. 7) After you can no longer see any soft or wet spots test a side of the paint and peel it back off of the press'n seal. There still might be areas where the paint is still wet under the middle of the puddle or under the cans. Wait another day or turn the cans upside down and let it dry thoroughly. 8 ) Once dry you can decorate all the cans and glue the top can to the other two. (don't do this before because when you have to turn the cans upside down to dry the bottoms you will have problems with the third one on top. If you have any questions please feel free to ask. Thanks for reading and visiting my blog. Have a wonderful day.